The sun always lights up half of the moon. Then, the other half of it is in complete darkness. We know this very well because this is the day and night on Earth that we experience on Earth. But from our viewpoint of the moon, we see that same “day-night line” which are the phases of the moon. When you’re out at night, remember that the phases of the moon depends on the angle the sun is hitting it. It also depends on the point of view where on Earth you see the moon. In general, we see 8 major phases of the moon. Sometimes, its shape is full, half or just a sliver. These are the phases of the moon. 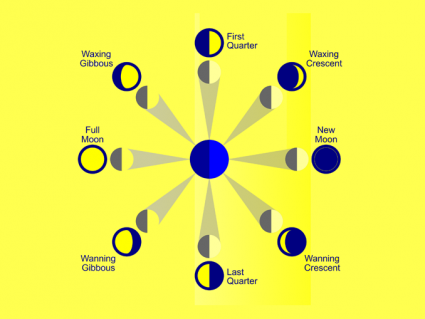 Full moon, new moon, half moon, quarter moon, waning moon and crescent moons… Let’s go through in more detail all the phases of the moon. 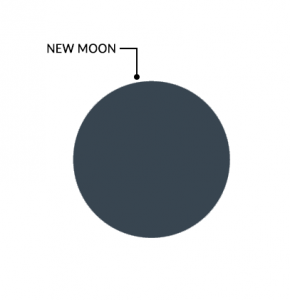 New moons are very difficult to see because a new moon is always closest to the sun. In other words, the sun isn’t shining on the moon from Earth’s perspective. That’s what makes is so hard to see a new moon. If the sun is on the other side of the moon, then this means that it’s a new moon. And this is really the first phase of the 8 major phases of the moon. Because the moon orbits the Earth, it moves a bit to the east after a couple of days. Now, we can see the moon at a slight angle with only a partial bit of it lit up. At this point, the crescent is still very thin. Similar to the new moon, a waxing crescent moon is still close to the moon but it has moved a bit to the east. When you see half of the dark and light side, then this means the moon is half full. The moon is orbiting and the waxing crescent moon is growing into a first quarter moon. 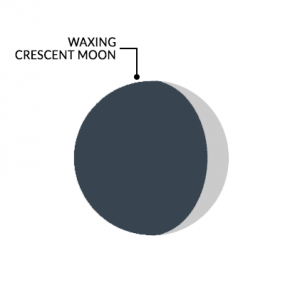 During a first quarter moon, the moon is farther away from the sun and it’s easier to see. This is the first time that the day-night line on the moon is half-way lit up. 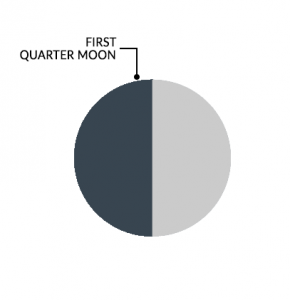 But it’s called a first quarter moon because its 1/4 of the way through it’s cycle back to a new moon. As it grows a bit more, it becomes a waxing gibbous moon. 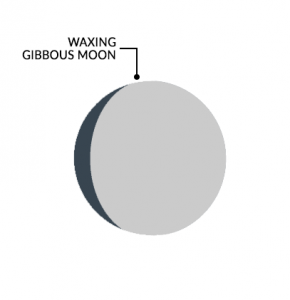 And gibbous simply means “convex” – that it’s more than half of a circle but less than a full circle. In this phase, we are very close to the moon being fully lit up from the sun. As the moon orbits the Earth more so, it finally approaches a full moon. A full moon is fully lit up from the perspective of the Earth. When the moon is on the opposite side of the Earth, the sun illuminates in its full. At this point, the moon has moved half-way through its orbit at 180 degrees. During a full moon, the Earth is between the sun and moon and is when the werewolves begin to transform. At this point, the moon is starting to orbit past 180 degrees into a waning gibbous moon. And we will cycle through the first 4 phases of the moon. Instead this time, it will be in reverse order. 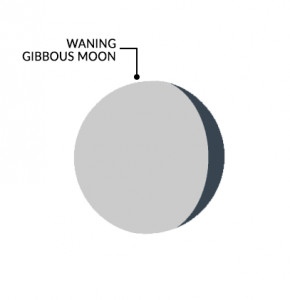 The waning gibbous moon means that its illuminated side is starting to shrink from a full moon. 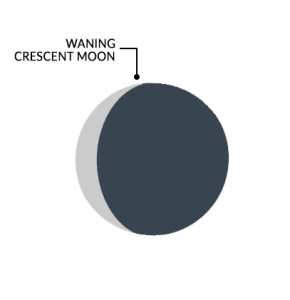 Waning means that the moon appears to recede in size because the sun is progressively illuminating a smaller portion of its visible surface. 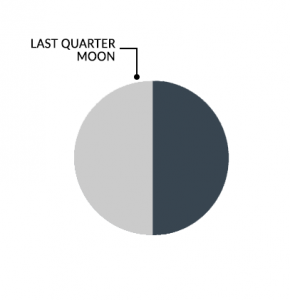 Once again, we are at a point where the moon appears to split in half as a last quarter moon. 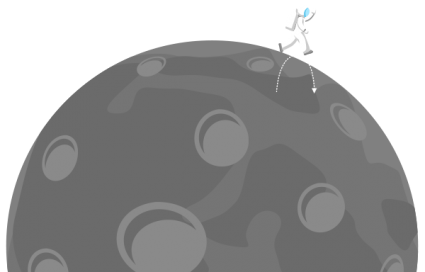 At this phase of the moon, it has cycled through 3/4 of its life. But it has reversed which side is lit by the sun. And instead of it progressively appearing more full, we begin to see less of the moon. It visibly appears to be shrinking as it approaches back to a new moon. A couple days after, you get a waning crescent moon. We start to see less and less of the moon as the moon orbits past the 270 degree cycle. When the moon has completed its full 360 degree orbit around the Earth, we are back to the first phase. The new moon phase marks the starting point of a brand new cycle of the moon. At all times, the sun illuminates half of the moon. This is the same as Earth because half the Earth is lit during the day and half of it is in darkness at night. As you can see in this diagram below, the Earth is in the center. When the moon orbits the Earth (dashed line), the sun always illuminates half of the moon. Because the sun is shining on the right-side, only the right-side of the moon is also illuminated. But it’s because of our perspective and where we are on Earth, how we see the 8 major phases of the moon. The moon looks bright from Earth because it’s in full sunlight. Because the moon is a sphere and orbits the Earth, we see it differently based on time. 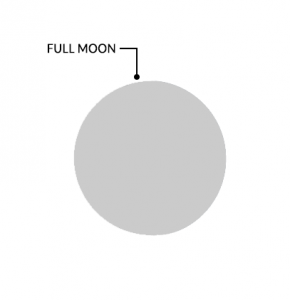 In the diagram, the phase of the moon is based on the position of the moon and how much sunlight is shining from the right-side. Overall, It’s the “day-night line” that we see from Earth that represents the 8 phases of moon. And we determine the phases of the moon by how much the moon is lit up by the sun.